Charlotte, Emily and Anne as they might have looked while writing. The Brontë sisters fascinate me. 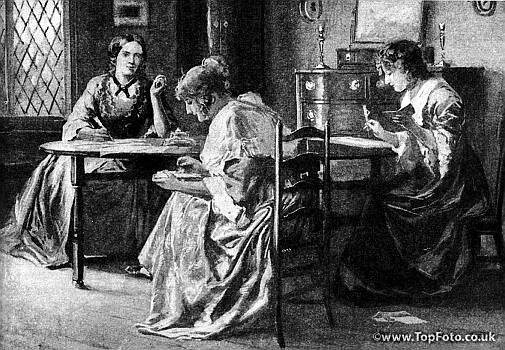 How did one family in the early 19th century produce not one but three influential female writers? There are several carefully researched theories of course, but I’m going to go with the furniture. 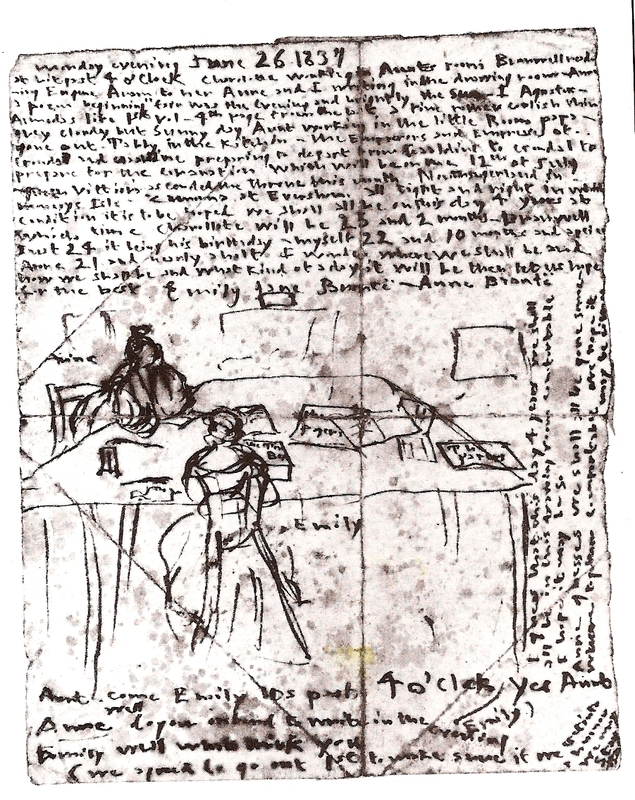 While Jane Austen was off at the side of the parlor writing secretly on a teeny tiny table and hiding her pages under a blotter when anyone came in, the Brontë sisters worked side by side at their dining room table with their drafts spread out around them. Yes they were encouraged to be prolific from very young and produced astounding quality work before their early deaths, but the crucial factor for me is the table and how they wrote. Some of the greatest novels of the 19th century took their initial shape there—Jane Eyre and Wuthering Heights,for instance. 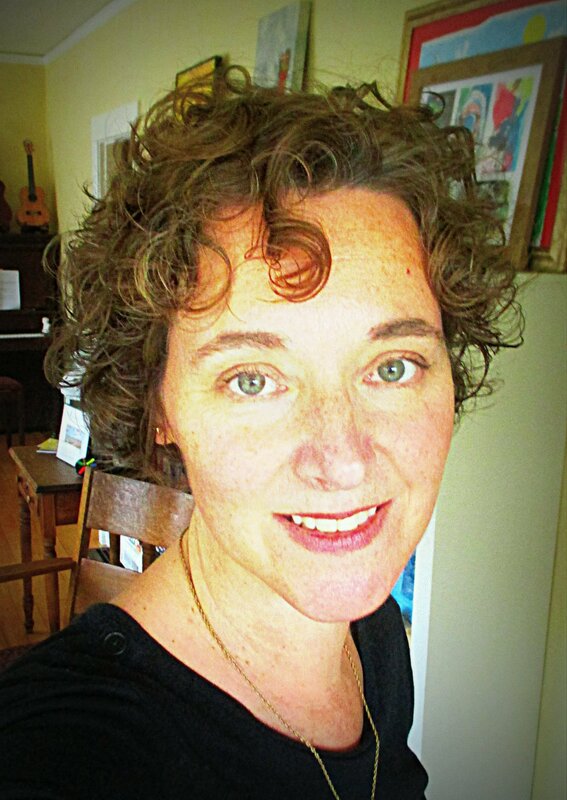 What’s the significance of a shared table for writers and creators of any kind? Emily’s sketch of herself and Anne working at the table. From her journal, dated 1837. The Brontës were said to get up at times and walk around the table while working out their thoughts. Around and around the table they went, thinking, talking, and spinning words. Without each other and the table, what are the chances their books would have been published and still read today? Even now, early in the 21st century, gathering at a table to create is still a radical act for many of us. Facebook CEO Sheryl Sandberg in an oft shared TED talk “Why Are There So Few Women Leaders?” tells women the first key to success is to, “Sit at the table.” Boardroom table or dining room table? Same difference. Don’t get stuck thinking your job is to serve others. Don’t take a chair against the wall. See that chair there in the inner circle? That one is yours. The table is the great equalizer. When it came time to publish their books, shocking for their time, the Brontës went with male pseudonyms first. Back then no respectable woman wrote about passion outside marriage, rage that could destroy but was not judged, or cheeky governesses who wouldn’t be pushed around. Governesses were usually not permitted to eat at the table with their employers, after all. In their books Emily, Charlotte and Anne protested that status, one they each would have to deal with. They were educated, unmarried women from a family without money, after all. Where did they likely get their uppity ideas? At their own table.